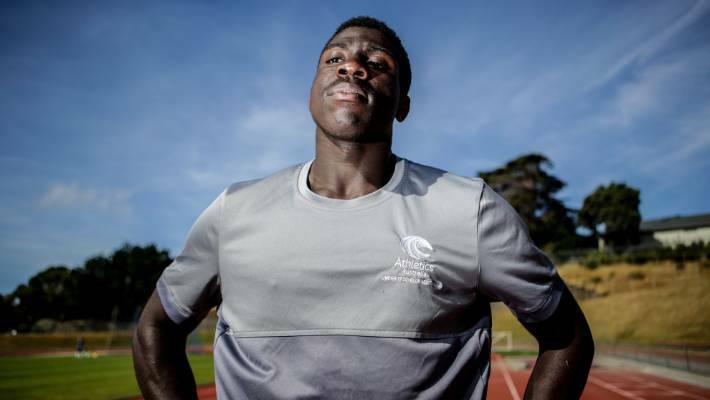 Edward Osei-Nketia, 17, has moved back to New Zealand to chase his dreams of running at the Olympic Games and playing for the All Blacks. He weighs 95kg and runs 100 metres in 10.19 seconds — but can he catch a ball? New Zealand Rugby is excited by the prospect of teenage sprint sensation Edward Osei-Nketia swapping his spikes for sprigs, but the organisation is tempering expectation as the 17-year-old sporting prodigy is yet to play a game for Scots College's First XV. "Like everyone else, we're delighted for Edward and his recent success on the track. We're always interested in talented athletes who have aspirations in our game. We look forward to watching him play rugby for Scots College this year," NZ Rugby's player development manager Matt Sexton said. The newly-crowned Australian 100m champion moved back to New Zealand at the beginning of the year to pursue a scholarship at Wellington's Scots College, ambitiously declaring he wanted to break his father Gus Nketia's national record and to one day play for the All Blacks. With athletics federations on both sides of the ditch keen on his services following his eye-catching 10.19 seconds dash in Sydney on Saturday, Osei-Nketia's achievements have also attracted interest within rugby circles, having already paid a visit to New Zealand's rugby sevens set-up. A devastating winger on the rugby field due to his sheer speed, Osei-Nketia said he averaged "three to four" tries per game for his previous school, St Edmund's College, and his YouTube highlights reel shows him leaving multiple defenders in his wake en route to the tryline. "I just want people to remember my name for a long time, when I'm long gone I want people to remember that I was a good runner or a good player," Osei-Nketia recently told Stuff. Standing 1.90m and weighing 95kg, former Olympic Games sprinter Chris Donaldson said Osei-Nketia was an exceptional talent who had all the physical attributes to become a successful rugby player if he decided to make a permanent switch from the track. "Even by the token of his physical attributes, he's big and strong and he's obviously only going to get stronger so he could be an outstanding rugby player," Donaldson said. "I'm not sure of the skills he has and that sort of stuff but in regards to his physical attributes he's got all those gifts that most people don't have to start with so it will be interesting to see what rugby want to do and the opportunities there. "He's faster than anyone in world rugby at moment so I really want to see him play and see what he's like." Osei-Nketia is expected to line up for Scots College's First XV next term.